Agavaceae. Zones 9b-11. Quite well known in the horticultural world. Sports beautiful grayish-blue foliage with a white margin. Well adapted for container use. 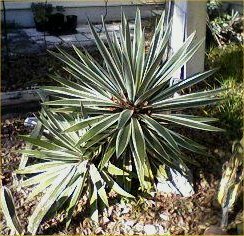 Makes an excellent specimen plant in the garden in warm climates. One of our mother plants bloomed last year with a 15 foot bloom stalk and produced many pups from the inflorescence, allowing us to have small plants for sale, which will last for many years in containers. Needs very well-drained soil in a warm, sunny spot.